This antibody is specific for Human cyclin B1. It does not cross-react with other cyclin family members. Synthetic peptide within Human Cyclin B1 aa 400-500 (C terminal). The exact sequence is proprietary. ab32053 reacts with an epitope located in teh C terminal region of Cyclin B1. Jurkat and HeLa whole cell lysate (ab150035). A trial size is available to purchase for this product. Our Abpromise guarantee covers the use of ab32053 in the following tested applications. WB 1/50000. Predicted molecular weight: 58 kDa. For unpurified use at 1/3000 - 1/20000. ab32053 (purified) at 1:20 dilution (2μg) immunoprecipitating Cyclin B1 in Jurkat (Human T cell leukemia T lymphocyte) whole cell lysate. Flow Cytometry analysis of HeLa (Human cervix adenocarcinoma epithelial cell) cells labeling Cyclin B1 with purified ab32053 at 1:400 dilution (1 µg/ml) (red). Cells were fixed with 80% Methanol and permeabilised with 0.1% Tween-20. A Goat anti rabbit IgG (Alexa Fluor® 488) secondary antibody was used at 1:2000 dilution. Isotype control - Rabbit monoclonal IgG (Left). Unlabeled control - Cell without incubation with primary antibody and secondary antibody (Blue). Cells were pre-treated with 20μg/ml RNaseA for 30min to minimize the binding between PI and RNA.Then intracellular stained with ab32053 and PI. 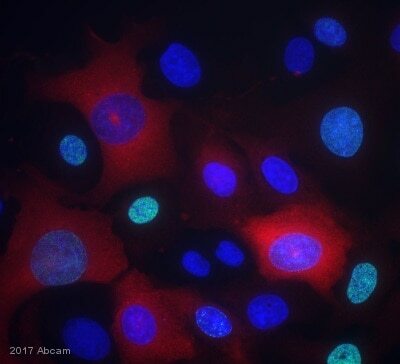 Immunocytochemistry/ Immunofluorescence analysis of HeLa (Human cervix adenocarcinoma epithelial cell) cells labeling Cyclin B1 with Purified ab32053 at 1:100 dilution. Cells were fixed in 100% Methanol. ab150077 Goat anti rabbit IgG(Alexa Fluor® 488) was used as the secondary antibody at 1:1000 dilution. DAPI nuclear counterstain. PBS instead of the primary antibody was used as the secondary antibody only control. Immunohistochemistry (Formalin/PFA-fixed paraffin-embedded sections) analysis of Human cervical carcinoma tissue sections labeling Cyclin B1 with Purified ab32053 at 1:250 dilution (1.47 μg/ml). Heat mediated antigen retrieval was performed using ab93684 (Tris/EDTA buffer, pH 9.0). Tissue was counterstained with Hematoxylin. 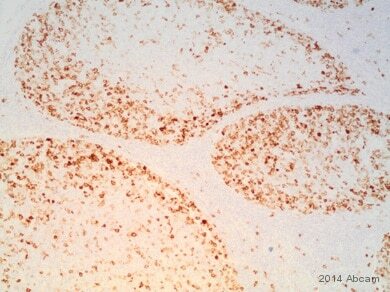 ImmunoHistoProbe one step HRP Polymer (ready to use) secondary antibody was used at 1:0 dilution. PBS instead of the primary antibody was used as the negative control. Lanes 1 - 3: Merged signal (red and green). Green - ab32053 observed at 55 kDa. Red - loading control, ab8245, observed at 37 kDa. Unpurified ab32053 was shown to specifically react with CCNB1 in wild-type HAP1 cells. No band was observed when CCNB1 knockout samples were examined. Wild-type and CCNB1 knockout samples were subjected to SDS-PAGE. Ab32053 and ab8245 (Mouse anti GAPDH loading control) were incubated overnight at 4°C at 1/3000 dilution and 1/10,000 dilution respectively. Blots were developed with Goat anti-Rabbit IgG H&L (IRDye® 800CW) preabsorbed ab216773 and Goat anti-Mouse IgG H&L (IRDye® 680RD) preabsorbed ab216776 secondary antibodies at 1/10,000 dilution for 1 hour at room temperature before imaging. Unpurified ab32053 at a 1:100 dilution staining Human cyclin B1 in human skin carcinoma, using Immunohistochemistry, Paraffin Embedded Tissue. Unpurified ab32053 staining Cyclin B1 in the U2OS cell line from human by ICC/IF (Immunocytochemistry/immunofluorescence).Cells were fixed with formaldehyde,permeabilized with 1% Triton X-100 in PBS and blocked with 1% BSA for 1 hour at 37°C.Alexa Fluor® 594-conjugated goat anti-rabbit IgG polyclonal was used as the secondary antibody. Overlay histogram showing Jurkat cells stained with unpurified ab32053 (red line). The cells were fixed with 80% methanol (5 min) and then permeabilized with 0.1% PBS-Tween for 20 min. The cells were then incubated in 1x PBS / 10% normal goat serum / 0.3M glycine to block non-specific protein-protein interactions followed by the antibody (ab32053, 1/20 dilution) for 30 min at 22°C. The secondary antibody used was DyLight® 488 goat anti-rabbit IgG (H+L) (ab96899) at 1/500 dilution for 30 min at 22°C. Isotype control antibody (black line) was rabbit IgG (monoclonal) ( 1µg/1x106 cells) used under the same conditions. Acquisition of >5,000 events was performed. Lane 1 : Hela cell lysate. Could you confirm the isotype of these antibodies? I can confirm that the abs have IgG1 isotype.